A new group is aiming to do their bit to address the cycling gender imbalance, member Bebhinn Hare explains. It takes a passionate woman to make a difference, and Dublin is full of them. So when one bike activist and social entrepreneur learned of the massive gender disparity of cyclists in this country, she put out the call. All of us who hold a major crush on our bicycle can understand why there was such a great response to bicycle campaigner Anne Bedos’s plan to create Wow (Women on Wheels). 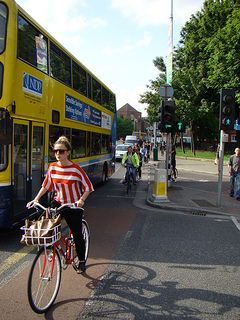 This new, informal Dublin-based group is focused on getting more women choosing bike over car. With a nearly 80:20, male/female split, something had to be done. “Anne told me the figures and I thought, we can only improve on that” says Wow’s Angelique Brunell, encapsulating the positivity of this “baby organisation”. During the inaugural meeting, Wow distilled some main themes as focus for its campaigning, including infrastructure, image and fear.Made up of one-time professional cyclists, bike-shop owners, ex-couriers, fixie fans and loads of average commuters, this informal group wants nothing more than to share its bike love and get more women on wheels . “For women the image thing is huge – it is a problem in society that women in professional jobs are often believed to have to look a certain way, and act a certain way, wear skirts, make up etc… all things that are a bit prohibitive on the bike, and issues blokes don’t have to deal with” says Heather Boyle, another Wow member and coordinator in Cycling Ireland. Wow is facing this head on, with a basket load of positive initiatives and inclusive social events on the way. 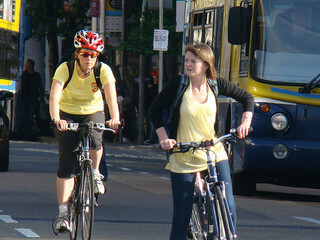 Safety fears also come up time and again as a reason not to cycle, with many women too apprehensive to make the change. One Wow lady shared her friend’s story of still being too scared to try a Dublin Bike, one whole year after registering. The perception of cycling as an unsafe activity is rife and Wowfeel that much of this fear can be allayed through knowledge and support. Wow’s Cycle Bus, arranged group cycles along major commuting routes, hopes to at least offer a chance to overcome the less than welcoming conditions through the power of numbers. “It will really give women a chance to try cycling to work along with someone who is more experienced and the companionship alone I think will get women out giving it a go,” says Wow’s Lisa Cavern. The present cycling climate challenges the average woman throughout all stages of her life. In her teenage years, at a time when the urge to conform is at its peak, the chance of her cycling drops to near zero. Image pressures on the young professional pile on and are followed by the struggle against a lack of suitable routes and facilities for mothers of young children. At what point is a woman supposed to see cycling as the better option? This is a good time to look for an answer. The Dublin Cycling Campaign, headed by its first female chairperson, Muireann O’Dea, is giving this issue a deserved focus in its Bike Week conference, ‘Growing Cycling Participation and Closing the Gender Gap’. In the mean time, Wow are going to keep doing their thing and they want you to be a part of it: “Join WOW, come to us and we’ll get you learning how to cycle with assertiveness, how to maintain your own bike, how to get friends who can cycle with you and to overcome your fear.” WOW is calling, will you listen? Excuses, excuses. We’ve heard them all. Wow members give their tips to get on the saddle. All Wows have something positive to say about how motorists’ attitudes towards cyclists are improving in Dublin (yes, really) but you still need to make yourself known to traffic for your own sake. 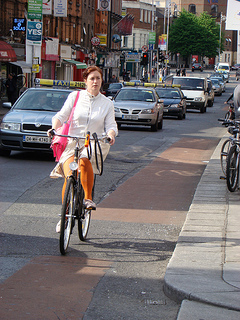 Lisa says: “The one thing that helped me most when I was be ginning to cycle in Dublin was to constantly remember to take the lane when you need it and not allow yourself to ride in the gutter. Just a half metre from the kerb is enough often to be in a safe place”. Each Wow will tell you that you have to choose your bike according to your lifestyle and activity level. Angelique chose a foldable bike, not for talking on the train but to combat her tendency to leave her old bike at home instead of dragging it up from the basement every morning. “It waits for me in the hall, I unfold it while I wait for the lift and then go down and when I go into the office, I just wait for my lift, fold it and I’m in.” Genius! If you need to get to the office looking/smelling presentable the WOWs will tell you their biggest secret, slow down, shhhhh, don’t tell anyone. A top tip from the experts that doesn’t cost you anything and actually works.